Workers remove Lonesome George's body from the Tortoise compound. Image Source: Reuters via Guardian. Giant tortoises are endanged and extinct due to sailors' hunting practices and the introduction of goats and pigs to the islands, which ate the vegetation in previous centuries. Great efforts have been made to save their species and subspecies over the past generation. 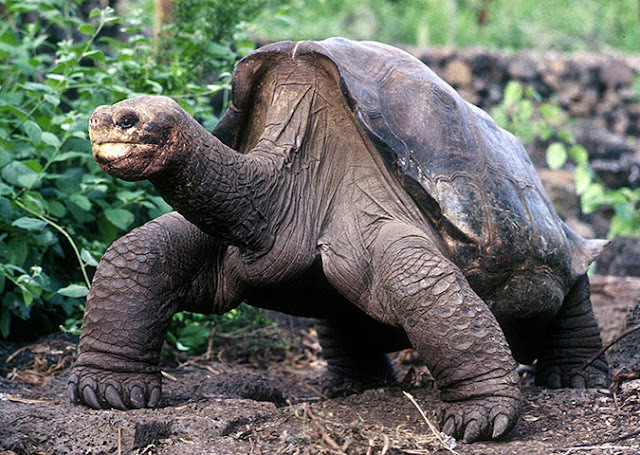 Without a female of his subspecies available, conservationists from Ecuador's Galapagos National Park have attempted to mate Lonesome George since 1993 with a close subspecies, the Española (Hood) island tortoise. That latter subspecies was saved from extinction. The eggs the female tortoises produced from these matings were unviable. There are two possible Pinta island tortoises remaining, although researchers are still working to confirm that they are in fact pure members of the subspecies. They are could be hybrids. 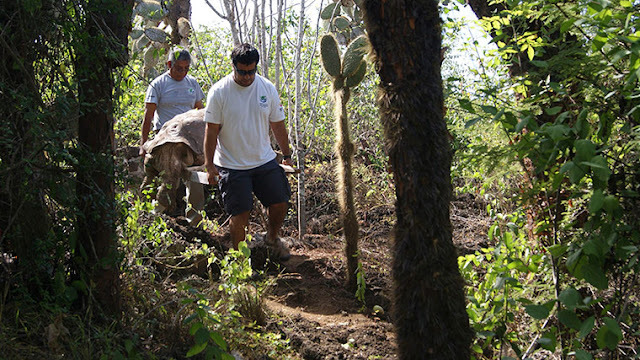 One tortoise, a male, might live on a neighbouring Galapagos island, Isabela, at the foot of Wolf Volcano (his existence is hypothesized because a Pinta island hybrid was found there in 2007, leading to the search for the purebred Pinta parent). The other possible Pinta (Abingdon) tortoise, identified by the shape of his shell, is Tony (Antonio); he lives in Prague Zoo. You can see a picture of him here. A purebred species can sometimes be revived through careful breeding of hybrid descendants. Who can say if the future holds such possibilities. A cloning program may one day be part of species conservation. 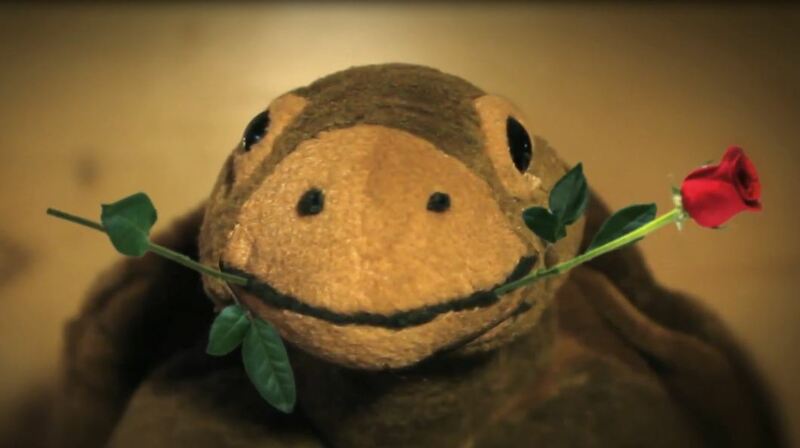 A Lonesome George toy from the 'Love George' fundraising appeal from Valentine's Day, 2012. Image Source: Galapagos Conservation Trust. I am a bit in love with your blog in it's thoughtfulness, it's directness, it's informed discussion, and it's beauty. While I read from post to post during a fit of insomnia I find myself thoroughly enchanted and provoked into contemplation upon a number of topics. While I have had at least a little knowledge of each topic I have read upon thus far, I have become more informed. Oh so delightfully informed. I admire a vast variety of things, often finding utter brilliance in something others would see as common. Though I sincerely doubt anyone would call your very thoughtfully written posts as common, they most assuredly would call them brilliant. I knew before my reading marathon ended I would leave you a thank you for the pleasure you have brought me. Seeing this post in memory of such an exquisite creature of beauty, I thought it a good place to do so for your blog is a uniqueness unto it's own. Not just in your posts, but in the informed and mature responses I have seen you give to different commenters as I've read through the different discussions. Even to the rather humorous spamming of an out of context lover of a certain country's women, or not, you responded in a fashion that I think would have all mothers show their daughters as an example of how to carry themselves with dignity even when responding to ignorancel and hatefulness. This is an odd comment, I know. I like to thank those who bring me insight and joy. So thank you and peace be with you. Dear CS, thank you very much for your kind comment. I am very happy that you enjoy my posts. It was my sense, after studying history for many years, that we are (either in fact or via media-driven perceptions) living through a momentous turning point in history. I did not want to live through such an era and not make a serious effort to understand it. Peter F. Drucker drew a parallel between the social, economic and political impact of the printing press and our own computers and the Information Age. He felt that the religious wars which followed the invention of the printing press were causally connected. In a similar way, I feel that huge changes cause a lot of stress, tension, aggravated politics, fear and so on. It is completely normal to feel hatred, rage, and anger under those conditions, because all the things that used to make sense simply no longer do. But it is what we do with that social alienation in times of radical upheaval that is most important. Troubled and unsettled sensibilities can be turned toward building a better future. I wanted to bring a historical perspective and technique to making sense of the turn of the millennium to try to alleviate some of those concerns. I am asking: when future historians look at the year 2012 (for example) what will they see in terms of general trends and why? If you feel I've succeeded to a degree in reconciling those different foci, I'm most gratified, thank you.